Class Officers: President, Robert J. Woodruff; Vice President, Ryan P. DeWitt; Secretary/Treasurer,Gerald R. Voigt; and Orator/Historian, Jason R. Goddard. PGM, John R. Louden Jr, 33o, with the class. Roderick L. Cookson receiving the Everett L. Lawrence Award. President, Robert J. Woodruff giving the class oration. Director of Work, John T.Dozier, MSA, summarizing the reunion. CIC, Frank E. Baumgartner, MSA 33o, thanks everyone for their support. 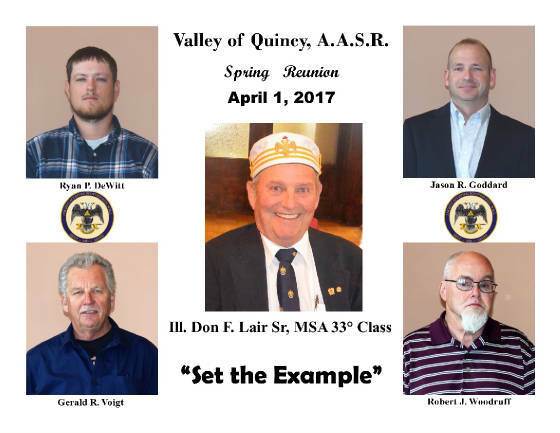 PGM Louden congratulating Don F. Lair, MSA 33o for class name.